“Keep fluoride out of our water” is the message from local group Whanganui Against Fluoride, which is hosting a public lecture. Internally renowned expert Professor Paul Connett, author of The Case Against Fluoride and former director of the Fluoride Action Network, will be presenting, as part of a nationwide speaking tour, organized by Fluoride Free NZ. “This is a great opportunity for our community to hear exactly why fluoride is so dangerous to our health and environment, and why we need to keep it out of our water,” says spokeswoman Lucy McDougall. DHBs do not have to consult the public, and are required to follow the directive of the Minister of Health, via the Crown Entities Act. Like National, the Government has voiced its plans to see fluoridation extended via The Health (Fluoridation of Drinking Water) Amendment Bill. “Everybody should have a choice over what goes into their body and their water. “When a town is fluoridated, it becomes inescapable, not only to our bodies but to our environment – no more organic gardening. Of the fluoride ingested only 50 per cent is excreted, the other 50 per cent accumulates in our arteries, bones and organs including the brain,” says Lucy. “Science tells us it carries major systemic health risks, particularly for vulnerable infants, children, elderly, and is linked as a contributing factor in hypothyroidism, ADHD, dementia, osteoporosis, arthritis, cone cancer, and ironically it damages the teeth, with an increasing percentage of people now presenting with fluorosis (fluoride poisoning) from fluoridated water, and the use of fluoridated toothpaste, that it is not safe to swallow. Even in its natural form, The Lancet medical journal has listed it as a neurotoxin, like lead and arsenic. “What is added to community water supplies is even worse, a toxic waste of the phosphate fertiliser industry, hydrofluorosilicic acid (HFA) that is illegal to emit into the air, dump on land, or ironically in water,” Lucy says. Professor Connett will be presenting the latest research on its detrimental effects on IQ, from a US Government backed multi million dollar study. 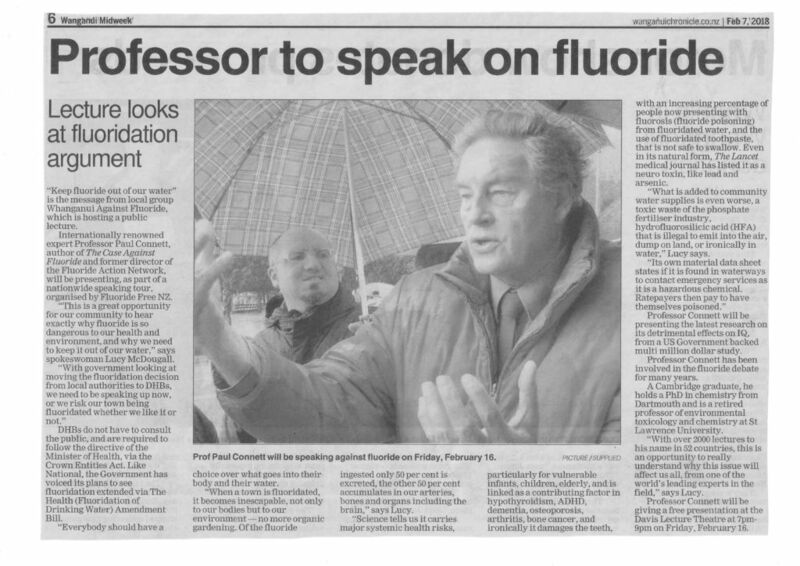 Professor Connett has been involved in the fluoride debate for many years. A Cambridge graduate, he holds a PhD in chemistry from Dartmouth and is a retired professor of environmental toxicology and chemistry at St Lawrence University. “With over 2000 lectures to his name in 52 countries, this is an opportunity to really understand why this issue will affect us all, from one of the world’s leading experts in the field,” says Lucy. Professor Connett will be giving a free presentation at the Davis Lecture Thursday at 7pm-9pm on Friday, February 18.